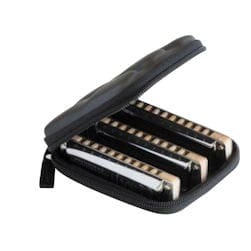 The Suzuki Manji harmonica has been designed from scratch by Suzuki’s R&D department. The comb is made of an all-new resin material which has the warm timbre of a wooden comb and the durability and non-absorbency of plastic. 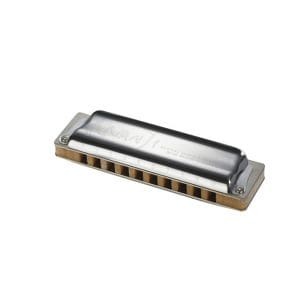 The comb produces a stronger, thicker tone and players have reported “It feels as if the comb vibrates with the reeds!” The stainless steel cover plates are designed to the desires of blues and rock harmonica players and gives full sound projection as the back sides of the covers are fully open and the big holes at both sides allow the player to hear the reeds directly. The reed plates are precision made of Phosphor Bronze and the reeds combine dynamic sound with long endurance giving this harmonica easy over blowing characteristics. The SUZUKI Manji M-20! 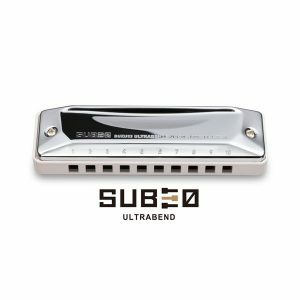 The more you play this incredible harmonica, the more you feel as if you are singing through the harp. It has to be tried to be believed. The Manji is named after Mr. Manji Suzuki, the company’s founder, now in his mid 80s, but still very much in charge. He started with a single hand-built model 70 years ago, and has built Suzuki into one of the world’s premier harmonica manufacturers. 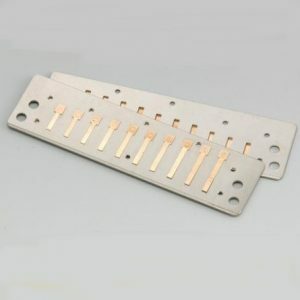 We now stock replacement reed plates for Suzuki Manji harmonicas. You can find them in Accessories under Reed Plates.